Proposed updates of the regulations governing entertainment facilities are seen as befitting the newly lively city. 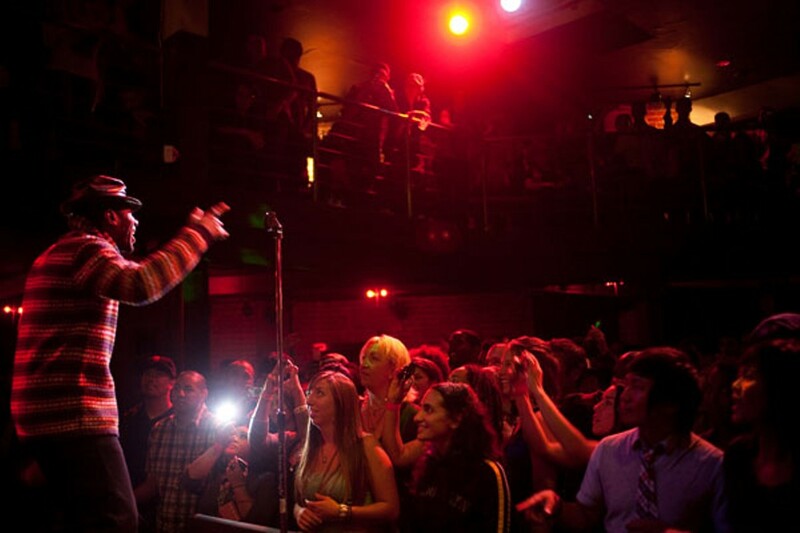 New clubs like the New Parish have given Oakland a venue for performers like Mos Def. Oakland's cabaret laws have long been a sore point for club owners, and a sign of Oakland not being in step with the times. They are vague and archaic, providing no distinction between large venues with dance floors and coffee shops with a singer-songwriter in the corner. City councilmember Rebecca Kaplan said they lump a lot of small venues together in a "gray area" by requiring them to navigate the same permit process, and pay the same $2,200 fee, as their larger counterparts. They obviously don't suit a city with a burgeoning entertainment district, and a new self-image to go along with it. Years of legal wrangling finally provoked Kaplan and fellow council member Nancy Nadel to sponsor a series of reforms. "Our entertainment ordinances have been needing to be updated for quite some time," Kaplan said. "They are from the Vaudeville era." Kaplan says her new proposal will clear up the abstruse language and change the current definition of a "cabaret" — which is currently any place that sells refreshments, plays music, screens films, or provides "radio broadcasts." It would also exempt small businesses from an arduous and costly permitting process, which includes background checks, fire inspections, and zoning clearances. Finally, it would include a new pilot program, allowing a handful of clubs to stay open after 2 a.m., albeit without serving alcohol. Clubs would have to apply for that privilege and pay a fee. The idea is to make Oakland more like a European city — or at least San Francisco. For cafes that actually follow the letter of the law, it's been a long time coming. "We're the only cafe on Piedmont Avenue that has one," said Art Garnello, who manages Oakland's Caffe Trieste. "So I guess the real question is, when do we get our money back?" Clearly, Oakland's downtown revitalization provides one impetus for such reforms. Formerly a home for hofbraus and sports bars, it's now a place where nightclubs double as galleries, and even small watering holes have jukeboxes or art on the walls. At the center of this newborn entertainment district are places like Luka's, Mua, Somar, the Uptown, the Fox Theater, the New Parish, the Layover, Mimosa Champagne Lounge, and the new Bench and Bar. "Oakland is finally full of booming and exciting new venues," said Kaplan. "We have the Layover, we have Mama Buzz — we didn't have these things going on ten years ago. It's a good sign. It means Oakland's entertainment sector is growing and thriving." The proposed reforms are still a work in progress. The reformers originally proposed a graduated system that would allow small places — those with an occupancy of fifty people or less — to pay a $600 "small cabaret exemption" and $250 annual renewal fee. That idea ultimately got tabled. Now, the plan is to have all cabarets pay a uniform registration fee, but exempt the small venues altogether. There's still some debate as to what constitutes a "small" business versus a large one; "small" would probably account for any business that doesn't serve alcohol, doesn't stay open past midnight, or doesn't charge a cover. Xiaojing Wong, a policy analyst for Nadel, expects the proposed registration fee to cost a lot less than the current price of a cabaret permit, even though the city may raise its annual renewal fee, which she said hasn't been updated in thirty years. Nadel says her staff is currently negotiating with the police department and trying to finalize the language, and hopes the proposal will go before the city council at the end of February. She and Kaplan think the overall premise isn't too controversial. Another proposed reform, which is based on policies in San Francisco and San Jose, would allow some clubs to stay open past 2 a.m. and stagger their closing times. Nadel and Kaplan see that as another win-win. It would keep Oakland from losing business to after-hours clubs in San Francisco, prevent a wave of bar patrons from simultaneously descending on the streets of Oakland at 2 a.m., and give some people a chance to sober up before heading home. In so doing, Nadel believes, it would obviate the need for extra police enforcement and save the city more money. "The idea is to find a solution that would possibly cost us less," she explained. "We're looking for ways to cut back on police overtime." But that's a tough sell for Officer Mike Morse of the Oakland Police Department, who has seen his fair share of bar fights and noisy after-hours loitering. "I think it lends itself to more activity," Morse said. "More cars driving around, more motorcycles driving around. A lot of the community that lives down there, you think they want to hear these motorcycles driving around at three in the morning?" Morse predicted that patrons would probably find ways to sneak alcohol into such after-hours establishments, even if the club owners complied with ABC laws. "I think you'd be hard-pressed to find any police officer who would think it was a good idea," he said. Even before the ink has dried on the proposal, club owners are already weighing in. Few people dispute the idea of streamlining registration and exempting small businesses. "I don't know why we were ever put on the same level as a coffeehouse, anyway," said Uptown Nightclub owner Larry Trujillo. But the proposed later closing times are another matter. Some think it's a terrific idea. New Parish co-owner Namane Mohlabane says it would allow his club to host shows that start later — say, if Dave Chappelle wants to go on at 11 p.m. and do a three-hour set, or if a band wants to do an intimate set after it performs at the Fox or Paramount. Bench and Bar vice president Frank Moore says it would be good for his club, too, since he's competing with a lot of gay after-hours joints in San Francisco. But other club owners say it's a nice idea that would be hard to implement. "I would like to have that option, but how often we'd take advantage of it, I don't know," said Trujillo, adding that it would cost him upward of $500 per hour to keep his club open after 2 a.m., and he probably wouldn't bring money in. Prozack Turner of the Layover agrees. "I'm not gonna hang out till five in the morning serving RC Cola," he said. The good news is that, for all the back-and-forth, Oakland may be about to come to its senses about cabaret reform. In previous years, the city's relationship to its entertainment district was anything but symbiotic. Small clubs ignored the permit requirements and tried to slip under the radar. Larger clubs did more harm than good, creating nuisances and interfering with the new housing developments downtown. At 2 a.m., the level of crowd control was comparable to that of Beale Street in Memphis, Mohlabane said. "You would see twenty cop cars out on the streets at 1:15 preparing for 2 a.m.," he said. "It was just like, 'Oh my god, is this really what it takes?'" Two years ago, Oakland reformed its cabaret law to make it easier and safer to have live entertainment in the city. But the results have been mixed. She will appear alongside rising stars Chinaka Hodge and Zoe Samudzi. Cameos include Mistah FAB, W. Kamau Bell, Coup bandleader Boots Riley, and former Black Panther Party leader Ericka Huggins. The event was less of a dialog, and more of an oral history of Seale's involvement in one of the most significant grassroots political organizations the United States has ever seen. Jonathan Singer-Vine's debut film is an honest coming-of-age. People who can't afford to hire an attorney have virtually no chance in court against well-heeled lawyers for banks and debt collection companies.